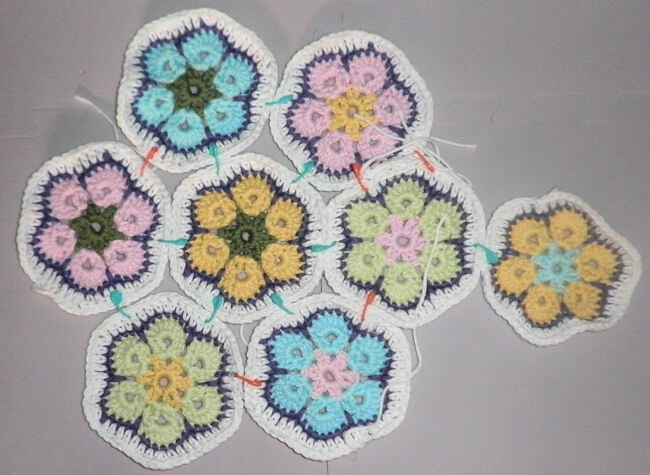 Once I’d made the potholders using this motif, I realized that they would make an interesting hot pad. After some finagling, I figured out how to lay out the motifs to make a double layered hot pad that will protect surfaces and can also be used as a potholder when needed. Insert hk into st, yo, pull through, sk next st, insert hk into third st, yo, pull through, yo, pull through all three lps on hk. Insert hk into st, yo, pull through, yo, pull through 2 lps on hk, sk next st, insert hk into third st, yo, pull through, yo, pull through 2 lps on hk, yo, pull through all lps on hk. Make 8 motifs through round 5. Do not join as you go. Place one motif in the center with six motifs around it. Use the stitch markers or safety pins to hold them together (place pins in center of ea straight edge). Add an eighth motif at the side of one of the six motifs. Fold the pieces over to the back and use stitch markers or safety pins to hold the other motifs to the back center piece. 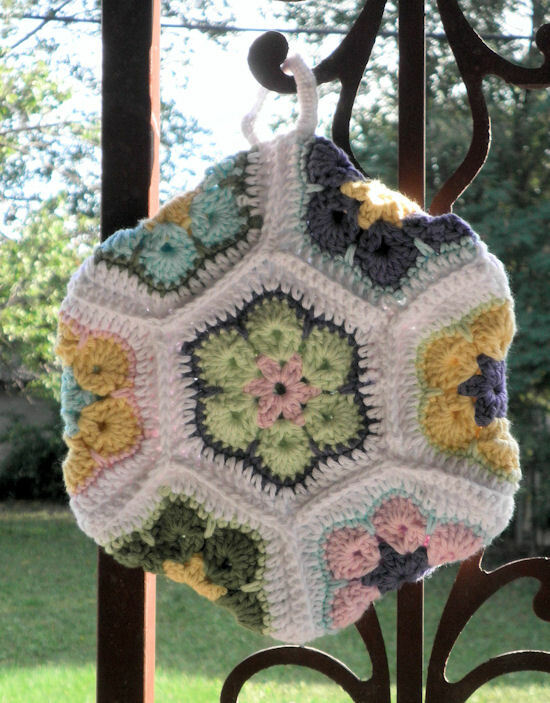 Join the pieces using a whip stitch (you’ll need to turn the piece inside out first making sure to leave an opening to turn it RS out again) or crochet it together using sc. You can basically follow the edges of the motifs around in a zigzag pattern or find some other method to keep going and reduce the number of ends to weave in later. Hold motifs with wrong sides together, join white at any “corner” – see first image of pattern, ch 10, join with sc in same st, 34 sc in ring (keep pushing sts back so they fit, sc in ch-1 sp again. Fasten off with a long tail. 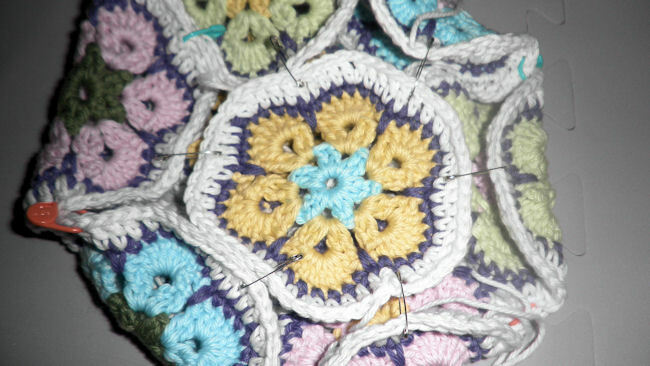 Note: Ring can also be made by crocheting sc around a plastic ring, then joining it to a corner of the joined motifs. Weave in all ends. Wash as block as needed.